« GTA V PC Specs, Can Your Rig Run It? If you’re looking for a good cheap gaming monitor then I’d highly suggest going with ASUS’s 19.5 inch VS207D-P monitor. This monitor has a resolution of 1600 x 900 and has a nice, clear picture quality while still keeping the price under $100. This monitor is totally optimized for the finest image and color quality. You can’t go wrong with this monitor if you’re looking for something good and cheap! This is a GREAT monitor if you’re on a tight budget but still wanting to have one that gets the job done and gives you a good experience. As I stated above, this monitor’s resolution is set at 1600 x 900 and that res looks great. It’s just one level under 1080p resolution which is 1920 x 1080 pixels. Although it’s not 1080p, you’ll be able to get even better frame rates then you would with a higher resolution monitor. Combined with the perfect aspect ratio of 16:9 and a 80,000,000:1 contrast ratio makes this monitor one very much so worth mentioning. With that kind of a ratio you’ll see just how great the contrast levels are once you see this LED screen in person while using it with your PC build. The main reason why this makes a great gaming monitor is because of its response time which is set to 5ms. The ms means milliseconds. The response time measures the time it takes to react to images and motion on any sort of display. The lower the number, generally, the better the quality. I currently use this monitor except I have the 21 inch version which is about $40 more expensive but I really wanted to get that 1080p resolution so that everything looked super HD. This monitor is set a level below that resolution and as I said earlier, even though textures and the like won’t be as high definition as a 1080p monitor you can in turn expect your FPS to have a major boost with basically any game you might be playing. One problem that I know you won’t face with this specific monitor is the wobbly stand that the other ASUS monitor models all have. Although the other models like the 21 inch monitor have a versatile viewing technology that allows you to move the screen in different angles, they also have a problem with a wobbly monitor stand. Whenever I bump into my desk or bump into the screen then the stand wobbles that monitor back and forth. Again, you won’t have this problem with this 19 inch model but you also won’t have the different viewing angles that the other models have. This 19.5 inch screen is able to fit two pages full on the screen. What I mean by that is you could have your internet browser open on one side of the screen while also having another application window open on the other side while still being wide enough to be able to work on whatever it is you might be working on optimally. This monitor is able to be plugged in via VGA only. There is no HDMI or DVI plug in. Now this might make you think that the quality is going to turn out bad, but in reality it’s really not too much of a difference to affect you and your gameplay experience. If you’re more of a gamer that cares more about how fun a game is and how it plays then this monitor will be perfect for you. If you’re a perfectionist when it comes to graphic settings and seeing how great a PC game can look this you should maybe look at a different model of the ASUS monitor. HDMI and DVI are HD ports that allow for super high definition display. All in all, if you’re looking for a monitor that will simply get the job done and give you a good picture quality experience for your PC while you’re on a tight budget then this would definitely be the monitor choice for you. It’s price point is great and the quality is just right where it makes it worth the purchase! So what do you guys think of my ASUS 19 inch monitor review? Is this a good cheap gaming monitor? Tagged asus, asus monitor, computer monitor, good cheap gaming monitor, monitor, monitor on a budget. Bookmark the permalink. 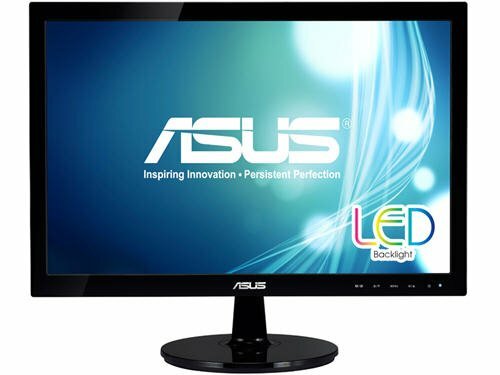 Looks like the Asus 19 inch would be a good starter monitor for my son’s gaming system. It would be sturdier on the desk and has good picture qualities. Indeed, John! This would definitely make a great monitor, for any PC! Hey, thanks for sharing your review & thanks for linking to the best deal! Hey, no problem Wayne! Amazon always has the best deals! Although this is a great monitor, I’ll go with the same one you have, Colton, because I would want full HD. It’d definitely be worth the extra investment for it, it’s really nice because it’s at a pretty fair price for the quality that you get out of it.